Army Warns Of 'Armed Citizens' Trying To Protect Recruiting Stations : The Two-Way Vigilante guards — some associated with militia groups — have been appearing outside recruiting stations around the country, ostensibly to protect them in the wake of the Chattanooga shootings. Members of the FBI Evidence Response Team investigate the shooting at the Armed Forces Career Center/National Guard Recruitment Office on July 17 in Chattanooga, Tenn. Since the shooting, armed civilians have begun trying to guard such centers. The Army is not happy about armed civilians who have been appearing at recruiting stations in several states in the wake of the Chattanooga shootings, ostensibly to help guard against such attacks. According to Stars and Stripes, a U.S. Army Recruiting Command policy letter issued on Monday warns soldiers to "avoid anyone standing outside the recruiting centers attempting to offer protection and report them to local law enforcement and the command, if they feel threatened." The directive follows last week's attack by lone gunman Mohammod Youssuf Abdulazeez on a recruiting station and another military facility in Chattanooga that resulted in the deaths of five service members. The U.S. Army newspaper reports: "Armed citizens — some associated with activist groups and militias — were standing vigil outside recruiting centers in Wisconsin, Georgia, Tennessee, Idaho and elsewhere this week, saying they want to provide protection to servicemembers barred from carrying firearms on duty." 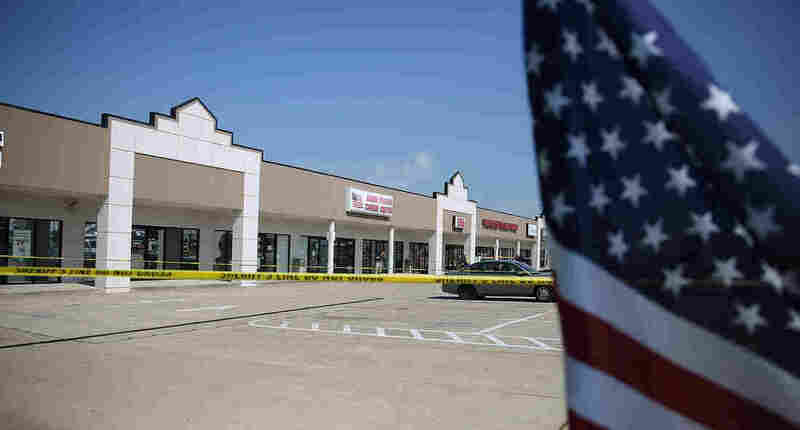 MySanAntonio.com also reports that on Wednesday, "Civilians carrying weapons turned up outside military recruiting centers in at least four Texas cities over the past day or two, a reaction to last week's shooting in Chattanooga, Tennessee that left four Marines and a sailor dead." And KOMO News.com says two civilians "armed with AR-15s and other weapons" from a group calling itself Great American Patriots 3 Percent stood in front of a recruiting center in Spanaway, Wash.
KOMO quoted one of the men, identified only as Zach, on Tuesday as saying: "We're just making sure that they're safe and that they get to go home at the end of the day." Zach said he was worried that the people who work at the recruitment center are not armed. "Somebody needs to be doing something about this," he told KOMO. "Somebody needs to be protecting those who aren't allowed to protect themselves." There were similar reports in Bellevue, Wash., where an armed civilian in front of the local Armed Forces Career Center was quoted by KIRO TV as saying: "The whole 'keep them unarmed' thing is not the best choice when it's now an environment that's potentially hazardous for them." Department of Defense policy stipulates that only military police and law enforcement are allowed to carry a weapon on federal property. "I'm sure the citizens mean well, but we cannot assume this in every case and we do not want to advocate this behavior," according to the Army Command Operations Center-Security Division letter. "Recruiters were ordered not to interact or acknowledge the armed civilians, who have been greeted by a mix of concern, indifference and gratitude by the public. "'If questioned by these alleged concerned citizens, be polite, professional and terminate the conversation immediately and report the incident to local law enforcement ...,' the command advised."